Chief executive Stuart Rose announced a package of reforms, saying his aim was to give M&S "back to our customers". He promised a simplification of the firm to focus on its core retail side. M&S shares showed little reaction to the news and by the close they were down 4 pence at 364p - well below Mr Green's proposed offer of 400p a share. M&S plans to shut down stores as part of cost-cutting measures that aim to save £250m in the current financial year, rising to £320m by 2006/07. First on the chopping block will be the group's new Lifestyle concept store in Gateshead, while it also is halting the rollout of smaller Simply Food outlets. Mr Rose said that M&S will concentrate on its 11 million core customers - mainly women in the 35-55 age group, cutting product lines and brands. "Women want good clothes... our key task is to sell more clothes to core customers - who I think have been neglected," he said. "The business has substantial further trading potential." The High Street retailer is trying to convince investors that the turnaround plan will boost the value of the group beyond what Mr Green has offered. Under the shake-up proposals, M&S has also had its property portfolio revalued - upping the value from £2.2bn to £3.3bn - something else the group hopes investors will consider as they mull the bid. But Mr Rose denied that the investor payout - equivalent to £1 a share - was part of a move to bribe shareholders. He told the BBC that shareholders would make their decision after his presentation at the group's annual general meeting later this week. Last week, M&S dismissed Mr Green's improved offer of £9.1bn saying it "significantly undervalued" the firm. As part of his update today, Mr Rose pledged to deliver value "significantly in excess" of the 400p a share currently offered by Mr Green. A spokeswoman for Philip Green said he was waiting to see how the market reacted to the revival plan. Mr Green has said he will know within 48 hours whether M&S shareholders are backing the company or him. BBC business editor Jeff Randall said that the plans did not contain many surprises. "In terms of cash back, tidying up behind the scenes, good housekeeping et cetera, I don't think that is enough on its own," he added. "That gives the company what the City calls a 'cocaine high' - it feels good this year, but next year, without better trading, you're back where you began." "I can't see a really big rabbit in the hat," he told BBC News 24, adding that the shake-up was merely "good housekeeping". 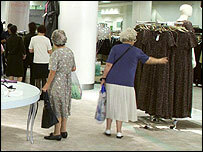 The one surprise was that M&S did not have ownership of the Per Una brand - which brought in profits of £17m last year. Mr Randall added that the company would now be concentrating on getting more female customers into the store more often by concentrating on its product range. M&S aims to cut back on its ranges, while offering more depth and less store clutter. Mr Rose also plans to make savings of about £175m a year by cutting costs in the supply chain. The moves, along with store closures, aim to tackle the group's sagging sales. Figures released with the statement show that M&S's non-food sales sank 3.7% year-on-year between April and June, while food sales were down 1.5% during the same period. The plans got a mixed reaction from City analysts. "I wonder whether this is enough," said BNP Paribas analyst Rebecca McLellan. "I think it's probably low to middle of the expected range, the cash sweetener could have been better, beyond that there's quite a lot of jam tomorrow in terms of cost savings." But Nick Bubb, an analyst at Evolution, described the reforms as "very punchy". "On the face of it, M&S is steering people to profits of £1.1bn next year which is a useful uplift and would justify a share price of 400p today," he said. "Achieving that through the sale of financial services rather than a sale of property is a brilliant piece of engineering." You can hear from both M&S boss Stuart Rose and billionaire retailer Philip Green in a BBC Radio Five Live special on Tuesday 13 July at 1900 UK time. In "the battle for Marks and Spencer", BBC business editor Jeff Randall will weigh up the opponents in one of the dirtiest corporate fights in recent times. "While promising better merchandise, Rose is also keeping shareholders sweet"